With the complicated fabric of the changing American family as a backdrop, the new Pew Research Center survey provides insight into how today’s parents are raising their children and laying the groundwork for their futures. Most parents say they are doing a good job raising their children, but some clearly face more challenges than others. Financial stress can affect parents’ overall sense of well-being and their assessments of how they are doing as parents and even the extent to which they feel supported in their parenting efforts by family and friends. Overall, the vast majority of U.S. parents say being a mother or father is enjoyable, rewarding and an important part of their overall identity. Most are satisfied with the amount of time they spend with their children, but at the same time, sizable minorities say they always feel rushed in their daily lives and most say they find parenting tiring and stressful at least some of the time. This chapter explores parents’ overall assessments of the role they play as parents, the challenges they face, and the networks and resources they draw on for support. While parents are possibly the most important variable in a child’s life, where the child is raised matters, too. A neighborhood can determine what schools children attend, who their friends are and what they can do in their free time. Most U.S. parents say their neighborhood is an excellent (34%) or very good (28%) place to raise children. One-in-five say their neighborhood is a good place to raise children. And 18% describe their neighborhood as fair (13%) or poor (5%). But there are stark differences in these assessments along socioeconomic lines. Parents with annual family incomes of $75,000 or higher give much more positive assessments of their neighborhoods than do middle- and lower-income parents: 78% say their neighborhood is an excellent or very good place to raise children, compared with 59% of those earning $30,000 to $74,999 and 42% of those earning less than $30,000 annually. Higher-income parents are twice as likely as those with incomes under $30,000 to say their neighborhood is an excellent place to raise children (44% vs. 22%). Among middle-income parents, 31% give their neighborhood an excellent rating. Lower-income parents, in turn, are far more likely to describe their neighborhood as a fair or poor place to raise kids. Fully a third of parents with incomes below $30,000 give their neighborhood a negative rating, compared with 18% of middle-income parents and 7% of those with incomes of $75,000 or higher. Large racial differences are apparent as well. Roughly seven-in-ten white parents say that their neighborhood is an excellent or very good place to raise children, while only about four-in-ten black and Hispanic parents say the same. Black (31%) and Hispanic (29%) parents are more than twice as likely as white parents (12%) to say their neighborhood is a fair or poor place to raise children. There is a significant, though smaller, racial difference in neighborhood assessments even after controlling for income. Among those with annual family incomes of $50,000 or higher, 79% of white parents and 68% of non-white parents say their neighborhood is an excellent or very good place to raise children. When asked about their household’s financial situation, U.S. parents describe a range of circumstances. One-third of parents say they live comfortably. Roughly the same share (32%) say they are able to meet their basic expenses with a little left over for extras. One-in-four parents say they are just able to meet their basic expenses, and 9% say they don’t even have enough to meet their basic expenses. Household financial circumstances differ markedly by family type. Among married parents, roughly four-in-ten (39%) say they live comfortably. Significantly smaller shares of parents who are living with a partner (23%) or have no spouse or partner (18%) say they live comfortably. Fully one-in-five (19%) of those with no spouse or partner say they don’t have enough money to meet their basic expenses. That is three times the rate as among married parents. Overall, about half of parents (46%) say they are doing a very good job as a parent. An equal share say they are doing a good job. Relatively few say they are doing a fair (7%) or poor (1%) job. While these ratings are not strongly linked to parents’ income or education, there is a strong correlation between parents’ perceived financial well-being and their assessments of how they are doing raising their children. Parents who say they live comfortably give themselves higher ratings than parents who have less financial breathing room. Some 56% of parents who describe their household financial situation as comfortable say they are doing a very good job as a parent. Among those who say they can meet their basic expenses with a little left over or just meet their expenses, about half say they are doing a good (rather than a very good) job as a parent. For those who have trouble meeting their expenses, 39% say they are doing a very good job as a parent, 38% say they are doing a good job, and 21% say they are doing only a fair or poor job. There is a significant gender gap on this question, with more mothers than fathers saying they are doing a very good job as a parent (51% vs. 39%). There are also differences by age, with younger parents (those ages 18 to 29) more likely than their older counterparts to give themselves top marks for parenting. The age gap is driven almost entirely by younger mothers. In fact, Millennial moms (those ages 18 to 34) are more likely than any other generational group to say they are doing a very good job as a parent. Fully 57% of Millennial mothers say this, compared with 48% of Gen X mothers and 41% of Baby Boomer mothers. Among Millennials, mothers are much more likely than fathers to give themselves the highest rating (43% of Millennial dads say they are doing a very good job as a parent). White and black parents are significantly more likely than Hispanic parents to give themselves high ratings for their parenting. About half of white (47%) and black parents (51%) say they are doing a very good job, compared with 38% of Hispanic parents. Parents’ marital status is not highly correlated with the overall ratings they give themselves for parenting. Whether they are married, living with a partner or neither, parents are about equally likely to say they are doing a very good job. And there are no significant differences among mothers depending on their work situation. Roughly equal shares of those who work full time (50%), those who work part time (54%) and those who do not work outside the home (51%) say they are doing a very job as a parent. Parents who have only young children in the home give themselves higher marks than parents who have teens at home. Among those whose oldest child is younger than 6, 52% say they are doing a very good job as a parent. By comparison, of parents with at least one teen in the house, 42% say the same. Parents care a lot about what their spouse or partner thinks of how they are doing as a parent, and they care what their own parents think as well. The opinions of friends and neighbors are important, too, but less so. 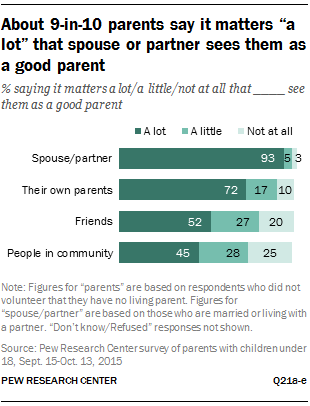 Among parents who are married, 92% say it matters a lot to them that their spouse sees them as a good parent. For those who are living with a partner, 95% say the same about their partner. This sentiment is shared across all major demographic groups. Among single parents, 56% say it matters a lot to them that their children’s other parent thinks they are doing a good job as a parent; an additional 20% say this matters a little. About seven-in-ten mothers and fathers (72%) say it matters a lot to them that their own parents see them as a good parent. An additional 17% say this matters a little to them, and 10% say it doesn’t matter at all. Similar shares of mothers (73%) and fathers (71%) say it matters a lot to them that their parents think they are a good parent. Hispanic parents are more likely than white or black parents to say their own parents’ opinion matters a lot to them – 86% of Hispanic parents say this, compared with 75% of black parents and 68% of white parents. Parents place less importance on the opinions of friends and people in their community. About half (52%) say it matters a lot to them that their friends see them as a good parent. An additional 27% say this matters a little to them, and 20% say it doesn’t matter at all. There is no significant difference between mothers and fathers on this measure – both value their friends’ opinions about equally. Some 45% of parents say it matters a lot to them that people in their community see them as a good parent. Again, there are no significant differences between mothers and fathers. Parents with at least some college experience (43%) are somewhat less likely than those with a high school diploma or less (51%) to say it matters a lot to them what people in the community think of their parenting. And middle- and higher-income parents are less likely than lower-income parents to say this matters a lot to them. Among religious groups, parents who are white, evangelical Protestants are more likely than white mainline Protestants or Catholics to say they care a lot about what people in their community think of how they are doing as a parent: 53% of white evangelical Protestants vs. 41% of white mainline Protestants and 38% of white Catholics say it matters a lot to them that people in their community see them as a good parent. For the vast majority of American parents, being a mother or father is an important part of their overall identity. Roughly six-in-ten (58%) say being a parent is extremely important to their identity, and an additional 36% say it is very important. Some 5% say being a parent is somewhat important to their identity, and only 1% say it’s not too important. Mothers and fathers are equally likely to say that parenting is central to who they are: 57% of fathers say being a dad is extremely important to their overall identity, and 58% of mothers say the same about being a mom. Millennial parents (60%) are somewhat more likely than parents who are Baby Boomers (51%) to say being a parent is extremely important to their identity. Some 58% of Gen X parents say the same. While white and black parents are equally likely to say being a mother or father is an extremely important part of their identity (62% and 61%, respectively), Hispanic parents are less likely to say this (47%). Being a mother or father is an equally important part of parents’ identity, regardless of the age of their children. Whether their youngest child is a preschooler or a teenager, parents are about equally likely to say being a parent is extremely important to their overall identity (60% among those whose youngest child is younger than 6, and 54% among those whose youngest is between ages 13 and 17). The extent to which mothers and fathers consider being a parent central to their overall identity does not vary significantly by marital status. About the same share of married parents, those who live with a partner and those who don’t have a spouse or partner say being a mother or father is extremely important to their identity. Similarly, working moms are just as likely as stay-at-home moms to say being a mother is central to their overall identity. About nine-in-ten parents say being a parent is rewarding for them all (53%) or most (35%) of the time. And a similar share say being a parent is enjoyable all (43%) or most (47%) of the time. Roughly equal shares of mothers and fathers say that parenting is rewarding and enjoyable all of the time. Parents with a college degree are somewhat less likely than other parents to say that being a parent is rewarding and enjoyable all of the time. For example, 31% of parents who have a bachelor’s degree or more education say being a parent is enjoyable for them all of the time. Some 45% of parents with some college education and 54% of those who never attended college say parenting is enjoyable all of the time. There is a significant age gap in the extent to which parents find parenting rewarding and enjoyable—these views differ by the age of the parent and by the age of their children. Millennial parents (52%) are more likely than Gen X or Boomer parents (39% for both groups) to say that parenting is enjoyable all of the time. It’s not surprising that younger parents find parenting more enjoyable given that they tend to have younger children. The survey finds that parents who have only young children (under age 6) are more likely than parents with older children to say that parenting is enjoyable and rewarding. Fully six-in-ten parents whose oldest (or only) child is younger than 6 say being a parent is rewarding all of the time. This compares with 51% of parents whose oldest child is between the ages of 6 and 12 and 50% of those whose oldest child is 13 to 17. Similarly, while 55% of parents whose oldest child is younger than 6 say being a parent is enjoyable all of the time, only about four-in-ten parents whose oldest child is ages 6 to 12 (39%) or 13 to 17 (41%) say the same. The survey finds that more parents say parenting is rewarding and enjoyable than say it is tiring and stressful. Still, one-third of parents say their job as a parent is tiring all (15%) or most (18%) of the time, and one-quarter say being a parent is stressful all (10%) or most (15%) of the time. Overwhelming majorities say being a parent is tiring or stressful at least some of the time. Mothers are somewhat more likely than fathers to say that being a parent is tiring all or most of the time (37% vs. 29%). 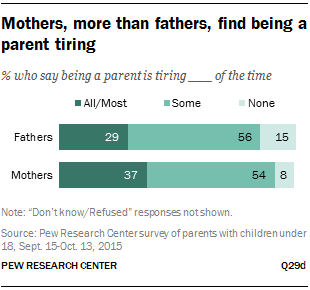 Some 15% of dads say that parenting is never tiring, compared with 8% of moms. The views of mothers and fathers are more similar when it comes to the stress of being a parent, though fathers are still somewhat more likely than mothers to say parenting is never stressful (12% vs. 7%). Children’s ages make a difference here as well. Parents who have at least one child younger than 6 are more likely than parents who do not to say parenting is tiring for them. Among those whose youngest (or only) child is younger than 6, 39% say parenting is tiring all or most of the time. Among parents whose youngest child is ages 6 to 12, 32% say parenting is tiring all or most of the time, and among those whose youngest child is ages 13 to 17, 25% say this. Feeling like there aren’t enough hours in the day no doubt contributes to feelings of stress and fatigue among parents. And most parents today say that they feel rushed at least some of the time. In fact, 31% say they always feel rushed, even to do the things they have to do. An additional 53% say they sometimes feel rushed. 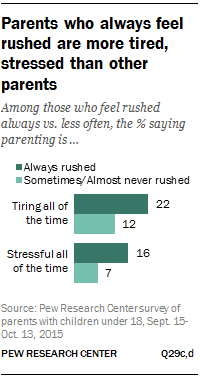 Only 15% of parents say they never feel rushed. Mothers are somewhat more likely than fathers to say they always feel rushed (33% vs. 28%), but even among fathers, 81% say they feel rushed at least some of the time. And among mothers, full-time working moms (40%) are significantly more likely than those who work outside the home part time or not at all (29%) to say they always feel rushed. Parents who say they always feel rushed are more likely than other parents to say that parenting is tiring all of the time (22% vs. 12% of parents who say they feel rushed sometimes or almost never) and they are twice as likely to say that being a parent is stressful all of the time (16% vs. 7%). Parents with three or more children aren’t any more likely than parents with one child to say they always feel rushed. And there are no significant differences according to children’s ages. Parents whose oldest child is a teenager and those whose children are all under age 6 are equally likely to say they always feel rushed. Even though many parents feel rushed in their daily lives, most (59%) say that they spend about the right amount of time with their children. About a third (36%) say they spend too little time with their children, and 5% say they spend too much time. There is a significant gender gap on this question: mothers (66%) are much more likely than fathers (50%) to say they spend the right amount of time with their children. Roughly half of dads (48%) say they spend too little time with their kids, compared with 25% of moms. While relatively few parents say they spend too much time with their children, parents who have only young children are more likely to say this than parents with school-aged children. Among those whose oldest child is younger than 6, 11% say they spend too much time with their kids. By comparison, only 4% of those whose oldest child is 6 or older say the same. When asked about the time they spend with their spouse or partner, about six-in-ten (59%) married or cohabiting parents say they spend about the right amount of time. Still, a sizable share (38%) say they spend too little time with their spouse or partner. Very few (2%) say they spend too much time. Mothers and fathers tend to agree on this point—nearly identical shares say they spend the right amount of time with their spouse or partner. White parents (41%) are more likely than black (29%) or Hispanic (32%) parents to say they spend too little time with their spouse or partner. Married parents are less satisfied with the amount of time they spend with their spouse than cohabiting parents are with the amount of time they spend with their partner. Among married parents, 40% say they don’t spend enough time with their spouse, and 58% say they spend the right amount of time. Among parents who are living with a partner but not married, fully 70% say they spend about the right amount of time with their partner; only 22% say they spend too little time. Just as work arrangements are linked to attitudes about time spent with children, in households where both the mom and the dad work full time parents are less satisfied with the amount of time they spend with their spouse or partner. Fully 44% of parents in these two full-time working parent households say they spend too little time with their spouse or partner. By comparison, only about a third of parents in households where only one parent works full time say the same (35%). These differences are largely driven by the attitudes of mothers with different work situations: Moms who work full time (44%) are much more likely than those who work part time (27%) or not at all (34%) to say they spend too little time with their spouse or partner. When it comes to free time, away from the kids, parents are evenly split. About half (53%) say that they don’t have enough time (or volunteer that they have no free time) away from their children to get together with friends or pursue hobbies and other interests, while 46% say they have about the right amount of time to do these things. Nearly identical shares of mothers (53%) and fathers (52%) say they don’t have enough free time. And there are no significant differences by race or education. Financial well-being is linked to perceptions about free time: 57% of those who say they live comfortably also say they have about the right amount of time away from their children to pursue outside interests. 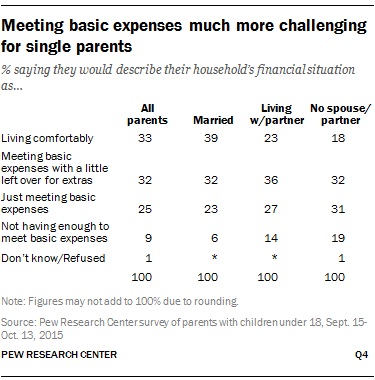 Among parents who say they can’t even meet their basic expenses, only 32% say they have enough free time. Parents who have multiple children are less satisfied with the amount of free time they have away from their kids: 58% of parents with two children and 55% of those with three or more say they don’t have enough time to spend with friends or on hobbies; 46% of parents with only one child say the same. There are significant differences among mothers by employment status. Fully 59% of full-time working moms say they don’t have enough time to spend with friends or pursue outside interests. Part-time working moms (48%) and moms who don’t work outside the home (47%) are less likely to express this sentiment. Full-time working dads are less likely than full-time working moms to say they don’t have enough time to spend with friends or pursue outside interests – some 45% of full-time working dads say this, while 52% of these dads are satisfied with the amount of time they have for these pursuits. Most American parents say that they have at least some support from friends or extended family when it comes to raising their children – 44% say they have a lot of support and an additional 39% say they have some support. Some 15% of U.S. parents say they have almost no support when it comes to raising their children, and 2% volunteer that they have no support at all. Moms and dads express similar views about their parenting support networks: 45% of mothers and 44% of fathers say they have a lot of support from friends and extended family when it comes to raising their children. The differences across racial and ethnic groups and by educational attainment are minimal. Marital status is also linked to parents’ perceptions about the level of support they receive from friends and extended family. Parents without a spouse or partner (22%) are significantly more likely than married parents (15%) to say that they have almost no support (or none at all) when it comes to raising their children. Whom do parents turn to for parenting advice? When parents need advice on raising their children, those who are married or living with a partner lean heavily on that person. Some 57% of these parents say they often turn to their spouse or partner for advice about parenting. An additional 23% say they sometimes rely on their spouse or partner for this type of advice, 8% say they rarely do, and 11% say they never do. Mothers and fathers are equally likely to say that they turn to their spouse or partner for advice on parenting. Parents are less reliant on other family members and on friends for parenting advice. Overall, 27% of parents say they often ask a family member (other than their spouse or partner, if they have one) for advice about raising their children. About a third (37%) say they sometimes do this, 21% say they rarely do and 16% say never they never do. Parents whose only or oldest child is younger than 6 are somewhat more likely than those with children ages 6 to 17 to say they often rely on a family members for advice about parenting (33% vs. 25%). Parents are less likely to use friends as a source of parenting advice. Overall, 15% of parents say they often turn to their friends for advice on parenting, and 35% say they sometimes do. Fully half of parents say they rarely (25%) or never (24%) check in with friends when they need advice about child rearing. There are significant gaps between mothers and fathers when it comes to seeking advice from family and friends. Mothers are much more likely than fathers to say they often turn to family members (other than their spouse or partner) for advice about parenting. Roughly a third of mothers (32%) say they often rely on family members for advice, while only 19% of fathers say they do the same. Some 44% of dads say they rarely or never get advice on parenting from family members, compared with 30% of moms. The gender gap is also large when it comes to friends. Roughly one-in-five mothers (21%) say they often turn to friends for advice about raising their children, and an additional 38% of moms say they sometimes do this. By comparison, 8% of dads say they often lean on friends for parenting advice, and 33% say they sometimes do. Three-in-ten dads say they never get parenting advice from friends (31% vs. 18% of moms). Relatively few parents say they rely on outside resources (rather than people) for parenting advice. Fewer than one-in-ten (7%) say they often turn to parenting websites, books or magazines for advice on how to raise their children. Even fewer (4%) say they regularly rely on online message boards, listservs or social media such as Facebook for parenting advice. Still, a significant share say they consult these outlets at least some of the time. About a third (34%) say they often or sometimes get advice from parenting websites, books or magazines, while 22% say they rarely do this and 44% say they never do. Internet sites where information is shared are used less often: 15% say they often or sometimes turn to online message boards, listservs or social media for parenting advice, 20% say they rarely do this and 64% say they never do. There are significant gaps between mothers and fathers in their reliance on these types of resources. Mothers (43%) are almost twice as likely as fathers (23%) to say they often or sometimes turn to parenting websites, books or magazines for advice. More than half of dads (56%) say they never use these types of resources for parenting advice, compared with 34% of moms. Mothers are more than twice as likely as fathers to say that they turn to online message boards, listservs or social media at least sometimes for advice on raising their kids (21% of moms vs. 9% of dads). College-educated moms are among the most likely to utilize these parenting resources. Fully half of moms with a college degree say they often or sometimes get advice from parenting websites, book or magazines. This compares with 39% of moms without a bachelor’s degree. There is an education gap among fathers as well, and, as a result, dads without a college degree are among the least likely to rely on parenting websites, books or magazines for advice (20% do so at least sometimes compared with 29% of college-educated dads). Similarly, college-educated moms are among the most likely to use online resources where information is shared to get parenting advice. One-in-four moms with a college degree say they often or sometimes turn to online message boards, listservs or social media for parenting advice. Fewer moms without a college degree (18%) say the same. There is no education gap among dads on this measure – 8% of college-educated dads and 9% of dads without a college degree say they often or sometimes use these types of resources. Parents who have a young child in the house are significantly more likely than parents with older children to say that they turn to any of these sources for parenting advice. Among those whose youngest child is under age 6, 43% say they often or sometimes turn to parenting websites, books or magazines for parenting advice. Among those who youngest child is between the ages of 6 and 12, 32% say they do this, and among those whose youngest child is ages 13 to 17, 21% say the same. Similarly, 20% of parents whose youngest child is under age 6 say they often or sometimes rely on online message boards, listservs or social media for parenting advice. About half the share of parents whose youngest child is age 6 or older say the same (11%).